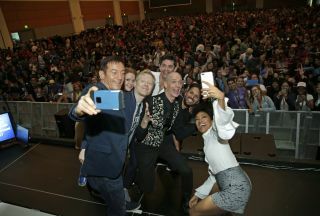 The cast of "Star Trek: Discovery" snaps a selfie with the crowd at the show's Comic-Con 2017 panel on July 22, 2017 in San Diego, California. SAN DIEGO — What would it be like for a bunch of "Star Trek" fans to become crew members on the Starship Enterprise? Mind-blowing, according to many of the cast members of the upcoming series "Star Trek: Discovery." "The first time I held a phaser, my head almost exploded," said Anthony Rapp, a fan of the franchise who plays Lt. Paul Stamets on the new show. Rapp and other cast members spoke to reporters during a news conference Saturday (July 22) here at Comic-Con. "I grew up watching reruns of the original series after school," said Rainn Wilson, who plays Harry Mudd, one of only a few characters in "Discovery" that first appeared in "Star Trek: The Original Series." "I built models of the Enterprise — I had the layout of the Enterprise memorized, like where the dorms were, and where everything was in the ship," he said. "And … in my episode, I got to use the transporter room. I got to be transported. And I got to use a phaser, and I got to sit in the captain's chair a little bit — all these iconic creations from Gene Roddenberry and his staff. And to get to relive those as an adult fan was just one of the greatest life experiences." Actor Rainn Wilson, who plays Harry Mudd on "Star Trek: Discovery," speaks to fans from a podium during the show's Comic-Con 2017 panel in San Diego, California on July 22, 2017. "It's true that it's an incredible, 8-year-old fantasy to say 'Energize!' or to point a phaser or to sit in the captain's chair," said Jason Isaacs, who plays Captain Gabriel Lorca. But for him, the most important part about the original "Star Trek" series was the "vision of the future where people have found a solution to divisions between people." "For me, the gadgets are fun and the sets are great and I'm sure we have all the whiz-bang stuff you would wish for," he said. "But what counts is … that we're showing the next generation [of viewers] what we could become as a planet, and therefore we might become. And that's what I love about it." Alex Kurtzman, one of the show's executive producers, echoed Isaacs' sentiment when he was asked about how the new show resembled previous "Star Trek" series. "The defining factor of "Star Trek" is [Gene] Roddenberry's optimistic view of the future, and the idea that he envisioned of a world where all species, all races came together not only to make our world better but to make every world better," Kurtzman said. "I think that's something that can never be lost in 'Trek.' I think once you lose that you lose the essence of what 'Star Trek' is." The original "Star Trek" TV series has often been held up as an example of diversity in casting. The central cast included an Asian-American man (George Takei) and an African-American woman (Nichelle Nichols). Sonequa Martin-Green was asked by a reporter from BlackGirlNerds.com about how it feels to follow in Nichols' footsteps. "I certainly stand on Nichelle's shoulders," Martin-Green said. "I think all of us stand on the shoulders of the innovation that's been in the 'Star Trek' cannon up to now … This is really a story of universality and this is a story of coming together and understanding that you really are one with all of life. I don't know if I can put it into words, honestly. … It's such a privilege to be a part of a story that I truly believe is gonna bring people together." "Star Trek: Discovery" premieres on CBS on Sept. 24, with subsequent episodes airing on the CBS All Access digital streaming service, which requires a subscription.